If you want I can offer a fixed date for the tour. In case of bad weather observing the sky with the testescope is dropped. Instead I offer a tour through the observatory including an explanation of the astronomical equipment. Additionall there wil be a lecture on astronomical themes (duration of the lecture about one hour). Optionally a new date can be fixed! for having a better chance of fair weather you can be placed on a waiting list. As soon as fair weather is likely to occure, and - as well - the astronomical situation is convenient, I contact the interested parties and fix an appointment. Please note, that for organisational reasons bookings can only be accepted for groups. The tours are then exclusively held for those groups. Group size is optimaly up to eight persons, the absolute maximum ist ten. This contact or booking does not oblige you to anything! You will only get additional informations! Is this booking a present, a surprise for friends? If wanted, you can get an elegant booking confirmation by mail! In this case just name the endowed person or group in the field below! How did you find DIRN Observatory? For mailing your inquiry or booking press "Send"! Please note: Pressing "Reset" resets the form! The Observatory is located adjacent to the cottages colony at Hohe DIRN (do not confuse this observatory with the observation site near Anton Schosser Mountain Lodge!). 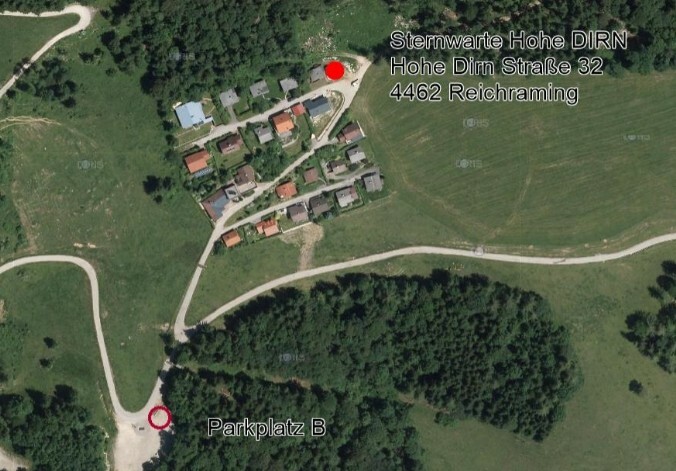 Please park your car at "Parkplatz B" - do not drive into the cottage colony!! It takes only 2 minutes to walk to the observatory!